Elegant open toe sandals with low heel. 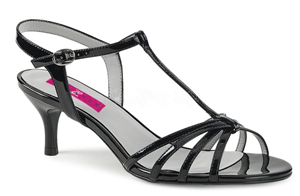 These amazing and glossy sandals with t-strap are a Must Have for every elegant lady ! The heel is located in a good place to balance easily. With a low heel of only 2 1/2" (6.4cm) also perfect for men for longer wearing and especially for transgender beginnners easier to learn walking in higher shoes.